A Tasty Mess: "Acorns were good until bread was found"
"Acorns were good until bread was found"
This quote by Francis Bacon sums up my love of bread quite well! In my opinion, there are few things better than freshly baked bread. Well, at least in the food world! I've been hunting for a good recipe for homemade sandwich-style bread in hopes to replace the loaves I buy commercially every week at the grocery store. ...and the list goes on! I was right on track with the first 6 ingredients, maybe even ok with the next 3, but after that they lost me. And how does one small loaf (16 oz) of bread necessitate all of those ingredients? I know that so much is added in order to preserve it and prolong the shelf life, but what if there was a way around that? At it's core, isn't bread just yeast, flour, water and salt? And so I've been on the hunt for a simple bread recipe. I didn't want to go 100% whole wheat flour just yet, mostly because when I've tried it in the past it makes for very dense un-sandwich-like loaves. I also am not interested in going gluten-free, so after slogging through a ton of recipes, I found an extremely simple one I could adapt to make my own. The bread turned out beautifully (photos below) and tastes fantastic. I might add in some flax seed or meal to add a little nutty flavor next time. Right now I'm storing a loaf in the freezer and one in the fridge, so we'll see how well it keeps. That's my main concern (other than flavor) when it comes to relying on homemade bread for our breakfast toast and lunching needs every week! If it does keep well I might just jump in and make the switch to homemade, it was certainly easy enough to produce. Have you tried any whole wheat bread recipes you'd be willing to share? 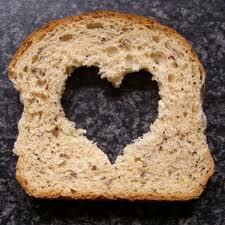 I would love to hear your ideas when it comes to switching from processed bread to homemade!